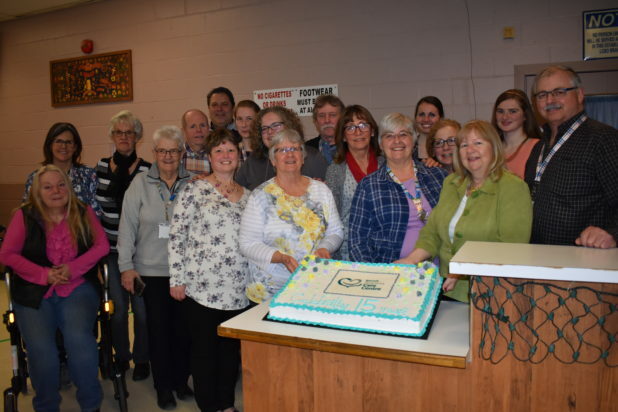 The Bancroft Pregnancy Care Centre celebrated its 15th anniversary in the community with its annual auction fundraiser on Friday, April 12. The Royal Canadian Legion Bancroft Branch 181 was full of community members enjoying freshly made appetizers and hors d’oeuvres while viewing a variety of items up for auction. There was a raffle, a silent auction, and a live auction with auctioneer Kevin Martin. There were roughly 120 items up for bid and some items included everything from homemade pies and hand carved sculptures to holiday travel getaways provided by local artists and businesses. This auction is one of BPCC’s main fundraisers, and with the community’s help the centre was able to raise over $21,500. This funding will go towards helping to run the centre and continuing the BPCC’s programs. The BPCC works to assist people who are dealing with a challenge related to pregnancy. An unplanned or difficult pregnancy can raise many questions and sometimes people do not know where to turn for help. The BPCC helps find solutions and offers support. It also helps those suffering from the grief associated with abortion, stillbirth or miscarriage. Raising a child can also be difficult and the BPCC has programs to help parents deal with the issues that having a baby can cause such emotional stress, financial problems and even the confusion around proper care of a little one. Three of the BPCC’s newest programs include Home, Supporting Dads and Hope Box. “Home” is an organizational program that helps families organize financially to deal with shopping for groceries and supplies, child care and even just general organization of their homes. The plan is to run this program twice a year in both spring and fall. Supporting Dads is a program run by two of the BPCC’s male volunteers. It is organized to help male caregivers learn how to be better father figures and provide what children need from their father. Hope Box is a program for families who are struggling with the loss of a child. BPCC members meet with the family and offer emotional support and guidance, which varies depending on what each family needs. They also provide a box that is filled with things to help them remember their child. These boxes are mailed out all over Canada from the BPCC. The BPCC also has other programs including, Take-A-Break, Living in Colour, the Baby Box program and the Diaper Bag program. Those interested in more information about the BPCC are invited to call them at 613-332-4673, visit their website at www.bancroft.ca or stop in at the centre.